Thanksgiving is just a few days away and it's nearly time to start putting up the Christmas tree and decor. 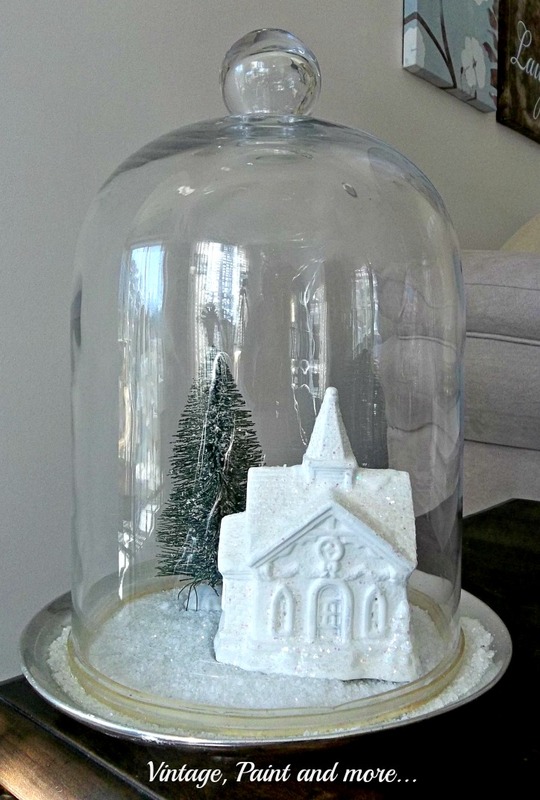 I and 20+ other bloggers are going to share our Christmas homes with you over the next few weeks. But before we do this years decor ( of which I have not even started) we decided we would do a Christmas 2013 Review. Last year I did a series called "A Handmade Christmas" in which I showed you how to decorate your home on a budget by making your own decor. As you know I love to craft and I enjoy making most of my own decor. So I tried to show you how beautiful your home can be with some very simple and budget friendly decor. 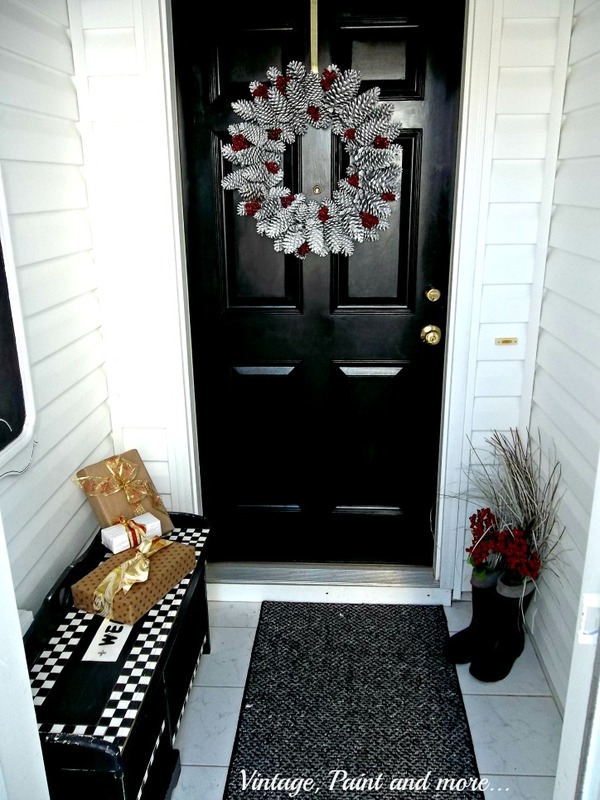 To start I showed you our entryway with the pine cone wreath that is so simple to make. Some Santa boots filled with grasses from the yard and packages made from cereal boxes wrapped with brown parcel paper and bits of ribbon. 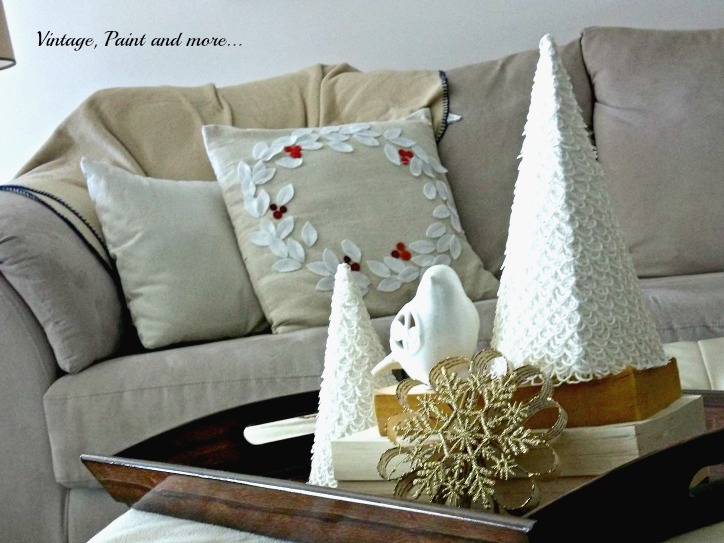 DIY'd thrift store furniture painted with DIY chalk paint and dressed up for the holidays. An old mirror painted as a chalkboard and sporting the word J-O-Y to greet visitors and DIY chalk painted bench with more cereal box packages. 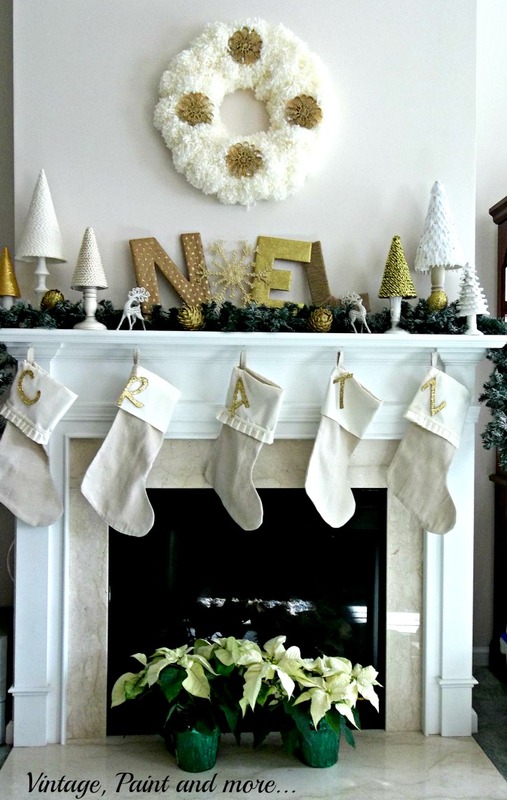 I kept our Christmas mantel quite neutral and simple this year with all creams, browns and golds. I handcrafted almost everything that I used on it. 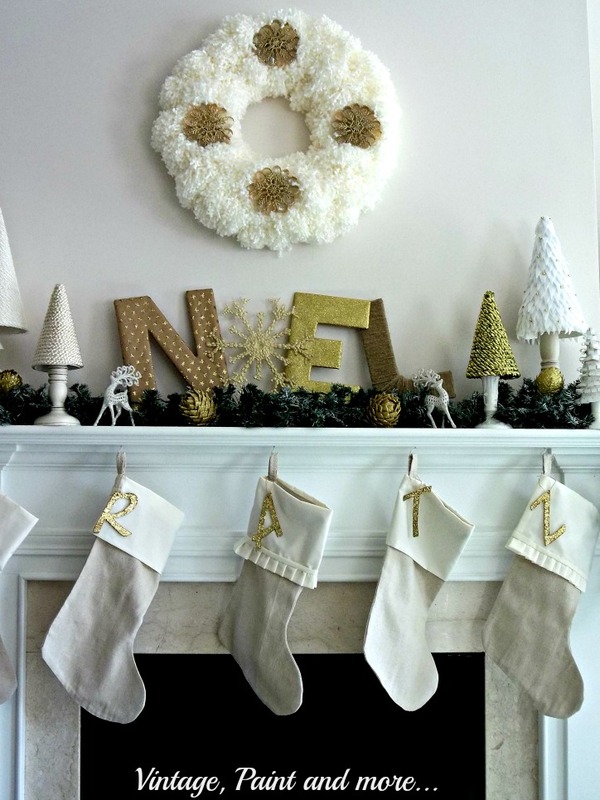 The stockings are made from a drop cloth and a sheet with a gold glittered initial on each one. The N-O-E-L is made from foam core letters I cut out and covered with scrapbook paper or twine and a dollar store snowflake.The cone trees are a trend I have gone crazy with making out of every kind of medium I can think of. Each year I add one or two more. I just can't seem to get enough of them. They are so simple to make and cost very little. The wreath above the fireplace I made with thick fluffy yarn and a wire wreath form. The snowflake ornaments I crafted from book pages and dollar store snowflakes. I also kept the tree in the neutrals with all gold and white ornaments. I used burlap ribbon and gold glittered tulle for the garland. 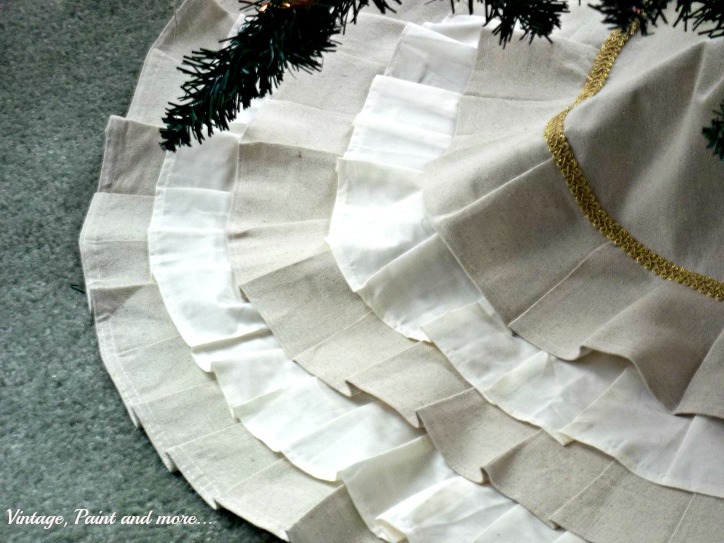 The tree skirt is made from a drop cloth and a sheet. 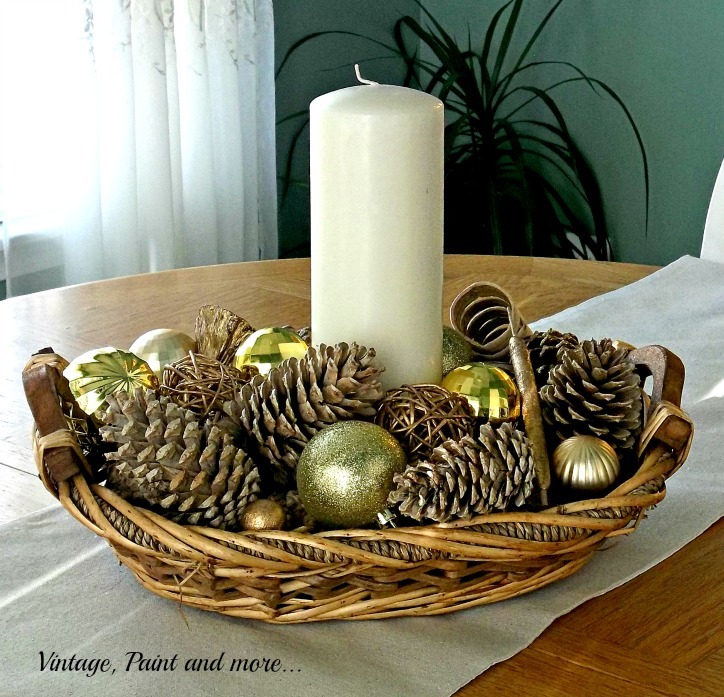 The dining room was kept simple with just the table center piece made form a thrift store basket with bleached pine cones and gold dollar store ornaments. 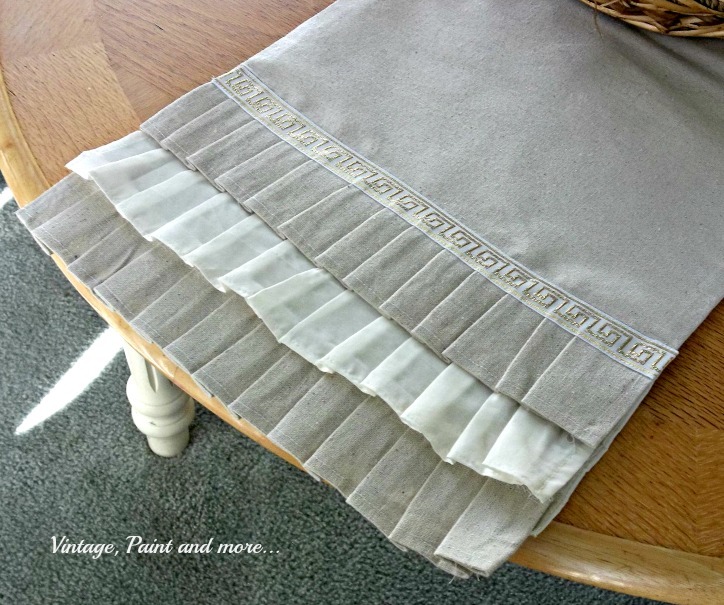 The table runner is made from a drop cloth and a sheet with a piece of trim I had on hand. 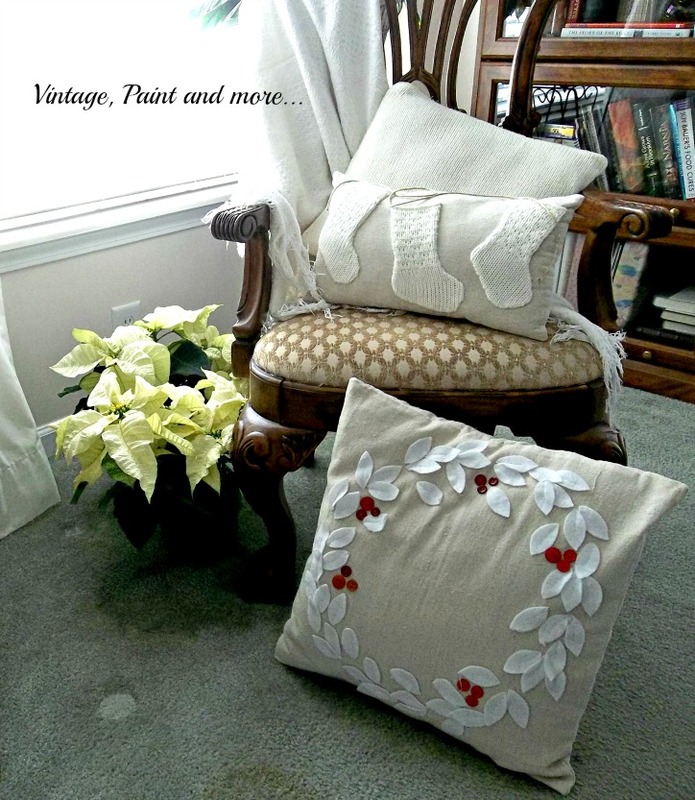 Easy vignettes were placed around the house with items that I had crafted in the past - all keeping in the neutral tones of whites and golds. These cone trees are made from poster board and buttonhole tape. So easy and yet so elegant. I love making pillow covers. These are some I have done. 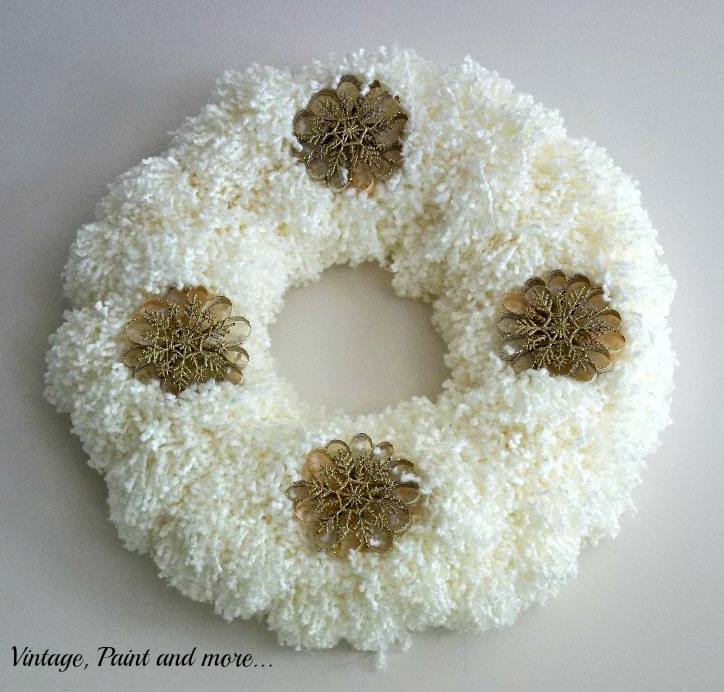 The wreath one is made from a drop cloth with white felt leaves and red buttons sewn on. The stocking pillow is a drop cloth pillow with stockings made from an old sweater and hanging from a piece of twine. The pillow behind the stocking pillow is made from an old sweater also. 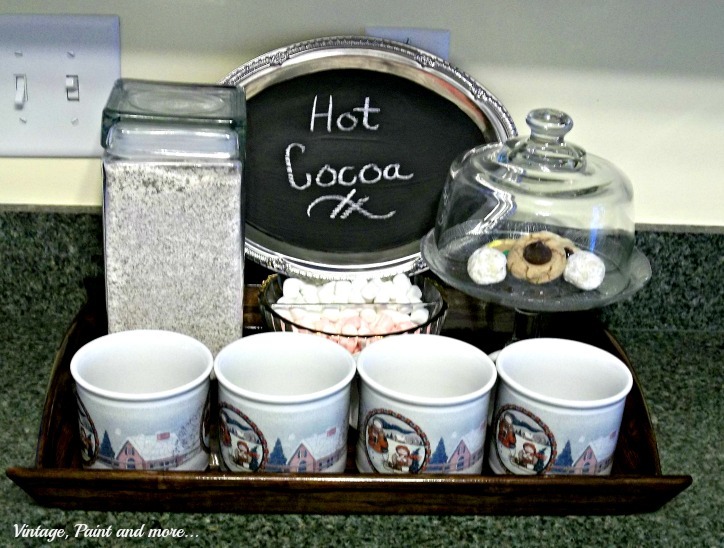 I also filled the kitchen with homemade items - homemade hot cocoa mix and homemade cookies and candies filled the cocoa bar for when the grand kids came to visit. The sign is a dollar store silver tray painted into a chalkboard. I hope you enjoyed my little review of last years neutral Christmas decor as much as I did putting it together. I love the way the creams, golds and browns play together so well and make such an elegant looking display for very little cost. This year I think you will be seeing more color - have to keep the family happy. Be sure and visit all the other bloggers on this tour. I know you will find so much great inspiration and creativeness in this group. I love the checker board entry. This is great. I love your Christmas decor. Beautiful! Love the idea making your own decor. It doesn't need much money to make beauty around. You have managed to spread a lot of it around! Oh my goodness all so pretty!! I love that JOY sign!! There are so many great ideas here, Cathy! I love the mantle with the letters and the boots by the entryway. Such great inspirations! Your decorating is beautiful, you have so many great ideas... Love the JOY Picture frame, your tree skirt, table runner and the pillows-especially the one with the stockings. I need to get my sewing machine out and try some of the ideas.. I am getting so inspired as I read all of these posts about Christmas. Everything looks beautiful! I'm really hoping you tell me that gorgeous tree skirt is no-sew?! Probably not, but I;m looking for a new one for a rather large tree but have no sewing skills what so ever!